Spicing up an upcoming event or celebration can be achieved using postcards. They can be used as invitations or after- party souvenirs. Achieving the postcard’s full potential can be done by making a catchy and remarkable postcard design. In line with this, today’s creative session will feature a tutorial on how to make a retro style postcard design for your upcoming event. This time we will be focusing more on the creative use of typography in making postcard designs. Note that you’ll be supplying your own text or event details in this tutorial. Download the free 6″ x 4″ Adobe Illustrator Postcard Template (with mailing guides) at UPrinting’s Free Template page. To add some retro and vintage look on our design we will be using an old paper texture background. Make sure to install the fonts on your computer before opening Photoshop and Illustrator for this tutorial. Open the 6″ x 4″ Adobe Illustrator Postcard Template. Create a New Layer by clicking the button on the Layers Panel. Drag and drop it underneath the “GUIDES” Layer and name it “Paper texture” by double clicking it. Open the paper texture file in Photoshop and lower the saturation to -50 by pressing CTRL+U. Hit OK. Select canvas (CTRL+A) and copy it (CTRL+C). Go to Illustrator and paste it (CTRL+V). Lock it so it won’t move around as we move on to the next steps. Start adding the text. On the Layers Panel in Illustrator, create New Layer. Take note that all the text in here are just dummies; you can place whatever text you want according to the event you’re celebrating. 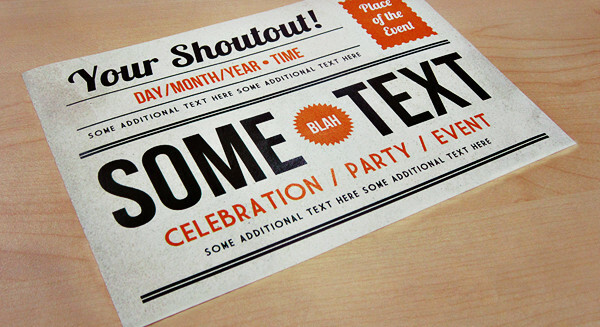 Using “Lobster” font, type your shoutout on the top left part of the canvas. I used dark gray color value (#333333). Put two lines underneath your shoutout with the same gray color using the Line Segment Tool . Use 1 pt for the stroke. Add some objects on your postcard. Go to Photoshop and create a new document (CTRL+N). Hit OK. Follow the specs below. Select Custom Shape Tool on your Tool Box. Draw the shape below. Adding this stamp-like shape will make the design look like more vintage/retro. Press “A” and highlight the whole object. Copy it (CTRL+C) then go to Illustrator and paste it (CTRL+V). Select “Compound Shape” and hit OK. Color it with orange (#ff6600). We are almost done! As you can see on the finished product, the texts and objects were semi-transparent. To achieve that, highlight all your layers (texts, lines and objects) except the old paper texture background. Select “Multiply” instead of “Normal” on the Transparency Panel. Add the remaining text. For questions, comments and suggestions, don’t forget to leave your comments below. Also, don’t forget to subscribe on our monthly newsletter to receive fresh updates from the blog. Follow us on Twitter, Facebook and Google Plus for your daily dose of awesomeness.